When Emilio Alzamora secured the 1999 World 125 Championship, he had Angel Nieto to thank. Alzamora clinched his world championship by a single point from Marco Melandri, without winning a race. The only other rider to win a world title without a race victory was Manuel Herreros, who took out the last ever 80cc championship in 1989. Alzamora’s team boss Angel Nieto Snr marked out one of the most remarkable careers in GP racing. 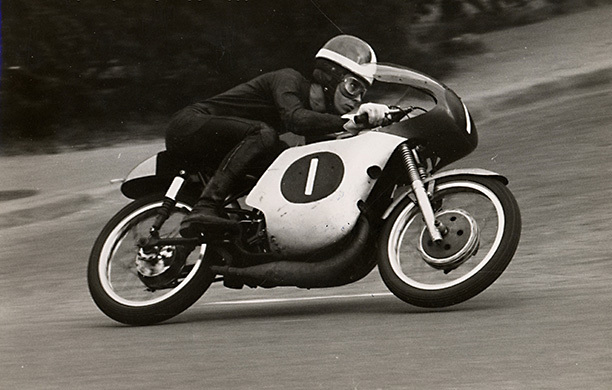 Making his race debut in the 50cc Belgian Grand Prix in 1964, Nieto racked up 12 +1 world championships (seven 50cc titles, six 125cc titles, 12 +1 because he was extremely superstitious!) and an incredible 90 GP victories before his retirement in 1986 aged 39. In his 22-years of world championship racing, Nieto made 139 visits to the podium. His first GP win was in the East German 50cc GP in 1969, the same meeting that claimed the life of fellow shotglass-bore legend Bill Ivy. Nieto’s last win was the 125cc GP at Silverstone in 1984, capping off an incredible 20-year grand prix career. In 1999, the irony was that the winningest rider in tiddler class history presided over the least winningest ever 125 championship. One of the most ferocious competitors in grand prix history, Nieto had to wildly signal Alzamora’s team-mate to literally stop before the finishing line to allow Alzamora through. And that team-mate was Nieto’s own son, Angel Nieto Jnr. The extraordinary events at the 1999 Australian 125 Grand Prix went initially unnoticed by most journalists tapping away on their nascent laptops in the air-conditioned media centre. Alzamora, who has since helped steer the careers of Marc and Alex Marquez, had been circulating in third place behind Melandri and Lucio Cecchinello for most of the 23-lap race when he crashed with just three laps to go, which sent the team into a spin. He remounted in 16th position and out of the points. Meanwhile, his Via Digital Honda team-mate Nieto Junior had been circulating in 13th place, then moved up to 12th on the penultimate lap. When Nieto Jnr appeared on the final straight to take the chequered flag, he went to wave to his team only to find his father Angel and others frantically jumping up and down on the pit wall imploring him to slow down in order to let Alzamora through to finish 15th to pick up a point. Nieto Jnr got the message and slowed dramatically, literally stopping the bike a few metres from the line on the outside of the track and waited for Alzamora to appear out of turn 12. This he did, taking the vital 15th place and the single point that literally secured him the championship. Nieto crossed the line in 18th. Had he not scored that point, Alzamora would’ve tied on points with Melandri, who would’ve won the championship on a countback courtesy of his five victories that year. Bruno Stolzer was another non-race winning world champion. The Swiss took out the 1979 B2B world sidecar championship for prototype outfits with engines located behind the driver. Several riders have claimed world titles with just one win including 1977 250cc world champion Mario Lega (one win from 12 races) and 1982 world 250cc champion Jean-Louis Tournadre (one win from 12 races). Nicky Hayden won the 2006 MotoGP Championship with two wins.